Climbers scale Mt. Everest, because its there, and chemists have their own version of this. Ever since G. N. Lewis introduced the concept of the electron-pair bond in 1916, the idea of a bond as having a formal bond-order has been seen as a useful way of thinking about molecules. The initial menagerie of single, double and triple formal bond orders (with a few half sizes) was extended in the 1960s to four, and in 2005 to five. 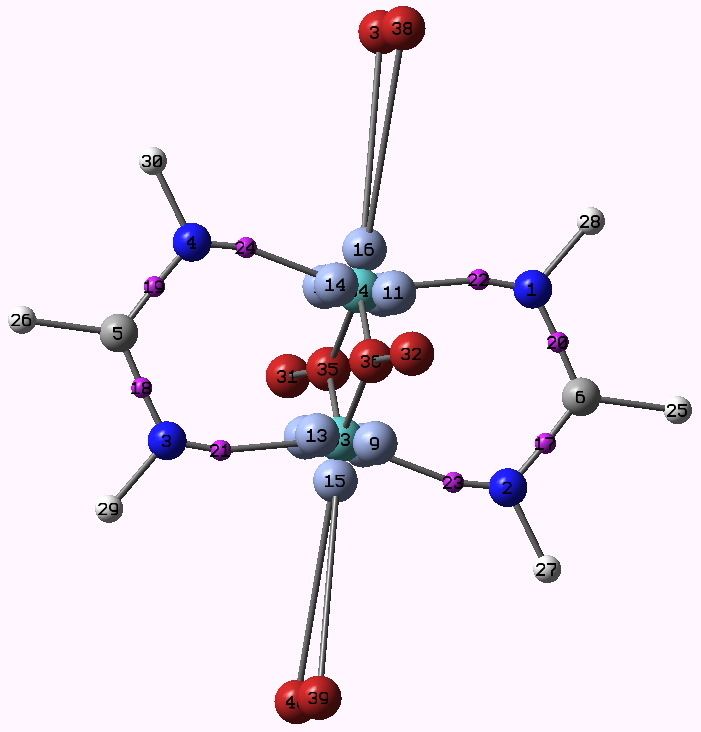 Since then, something of a race has developed to produce the compound with the shortest quintuple bond. One of the candidates for this honour is shown below (2008, DOI: 10.1002/anie.200803859) which is a crystalline species (a few diatomics which exist in the gas phase are also candidates; for other reviews of the topic see 10.1038/nchem.359, 10.1021/ja905035f and 10.1246/cl.2009.1122). (OK, its shown as a quadruple bond, but Chemdraw cannot handle five!). The Cr…Cr length is 1.74Å (R=aryl). It was also reported that DFT calculations (BP86/triple-ζ) reproduce this length well. The five highest occupied molecular orbitals are all centred around the Cr-Cr region, and the bonding is formally described as five pairs of electrons filling 1σ, 2π, and 2δ type molecular orbitals. So the electron pair bond, approaching its 100th birthday, is alive and well? But it does seem worth asking if those ten electrons really do cram together to occupy the region between the two Cr atoms. The stalwarts in these blog posts, AIM and ELF will be deployed to see if they too verify this simple concept. Firstly, AIM (calculated at the BP86/6-311G(d) level, DOI: 10042/to-4181 for a model system with R=H). The Cr…Cr region has the requisite bond critical point, and the value of ρ(r) at this point has the large value (for Cr) of 0.313 au, indeed hinting at a large bond order. The Laplacian ∇2ρ(r) has the more extraordinary value of +1.45 at this point, which makes it the strongest charge-shift bond ever noted (typically, ∇2ρ(r) is ~+0.5 for other examples of homonuclear charge-shift bonds, see DOI: 10.1038/nchem.327). This charge-shift character perhaps hints that this quintuple bond is no ordinary bond. Charge-shift bonds are characterized by valence bond structures where the covalent form may actually be repulsive, and the bond is stabilized instead by resonance with charge-shifted ionic valence bond forms. So given this, the ELF perhaps comes as no surprise. This diagram needs some explanation. The colour code is as follows: purple spheres represent the centroids of conventional disynaptic ELF basins. 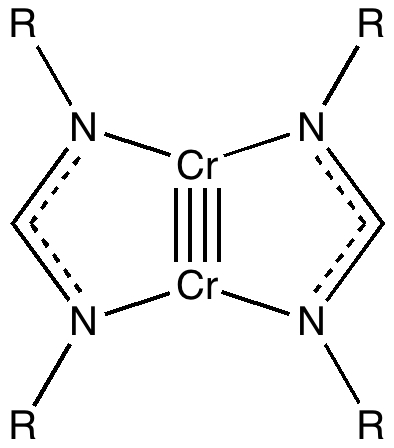 The only interesting ones are the four connecting the nitrogens to the Cr (21-24) which integrate to 3.35 electrons each. The cyan spheres (shown as 3,4 above) are the inner core-electrons of the Cr atoms (10.2 electrons of a neon core) and surrounding them are five further basins for each Cr integrating to 12 electrons per Cr. These include 8 of the outer-core (3s,3p) and four of the valence (3d, 4s) electrons, leaving ~2 valence Cr electrons not accounted for. Some of these final electrons are to be found in the basins represented by red spheres. The very diffuse (39, 40) basins far from the centre have a tiny electron integration (~0.003) and more missing Cr valence electrons are found in the bridging basins (32,36; 0.56 and 0.25 electrons each). 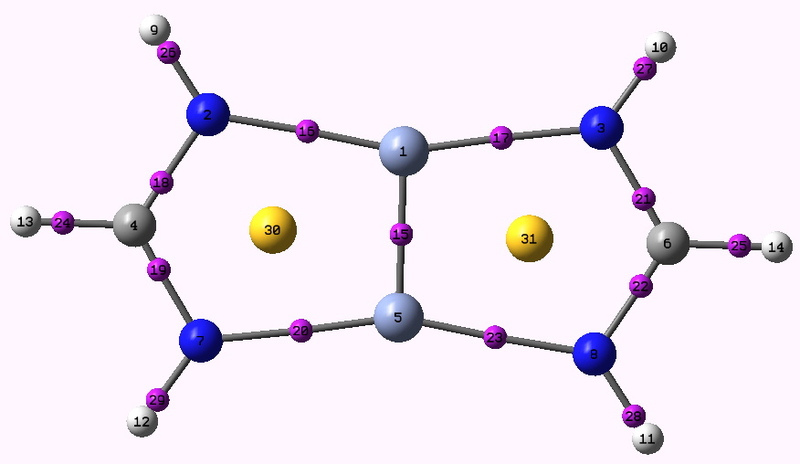 Added to the 2*3.35 electrons found in the Cr-N bond, this suggests the 3d/4s shell of the Cr is occupied by ~11.5 electrons. The 3d-shell is thus full, and the system is indeed an 18-electron (8+10) system with some occupancy of the 4s shell as well. An alternative view of the ELF surface can be seen below, showing the unusual environment surrounding the Cr pair. 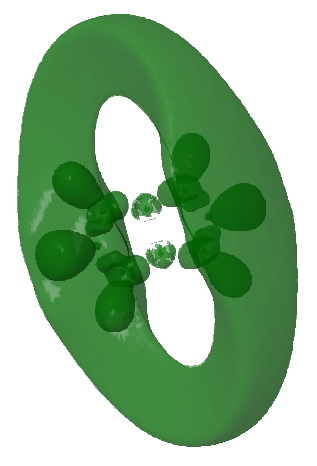 It seems that AIM (the topology of the electron density) and ELF (the topology of the electron localization function) are giving us quite different pictures of the quintuple bond. The latter does seem to indicate that the conventional covalent shared electron pair picture of this bond is not really what is going on, and that the idea of a quintuple bond as sharing five electron pairs in the bonding region between the two Cr atoms is not really realistic. It may be of course that the ELF concept also is not really applicable for such bonds (it is after all essentially an empirical function, the deeper significance of which is debatable). Nonetheless, the quintuple bond clearly has some surprises for us, and it would itself be no surprise to find out that controversy about the meaning of such a bond continues apace. This entry was posted on Tuesday, February 16th, 2010 at 6:48 pm and is filed under Hypervalency. You can follow any responses to this entry through the RSS 2.0 feed. You can leave a response, or trackback from your own site. Gosh, there is a lot to answer in your perceptive question. My post on quintuple bonds illustrates the difference between a blog (which addresses perhaps a very focused question or issue) and a text book, which tries to lay out the whole picture as a set of logical procedures. Blogs, as you point out, are not text books (at least mine is not). So the idea of hybridization, and electron shells (2[s], 6[p], 10[d], 14[f]) resulting in inert configurations (2, 2+6 =8, 2+6+10 = 18, 2+6+10+14 = 32) all derives of course from the simple solutions of the Schroedinger equation for a hydrogen atom. We should not forget this simplification when we try to deal with eg quintuple bonds. So if you want a hydrogen-atom like picture for such a bond, go see if this earlier post perhaps helps explain how the shells fill up. There I deal with the elements Nitrogen (for a triple bond), Vanadium (for a quintuple bond) and Pr (which in principle could extend the bond order beyond five to eight, the ultimate chemical limit of possible bond order, and one unlikely to ever be achieved). What we see there is that the simple hierarchy (s<p<d<f) which can be used to derive eg hybridizations is often subverted by all sorts of effects which the hydrogen-atom model cannot handle. Thus, a result of the radial behaviour of the 1s/2s/3s/4s vs 2p/3p/4p/ vs 3d/4d/5d etc functions, you get all sorts of inversions in this order (which also occur because of relativistic effects!) Hence as one moves down the periodic table, things get very complex (and of course the simple filled shell theory with integer occupancy is replaced by the so-called multi-reference theories where one has non integer occupancies). Having said that, one useful way of looking at things (which Pekka Pykko uses) is to remember that the most stable AO of any series is eg the 1s, the 2p, the 3d and the 4f. This simple rule explains why dinitrogen has the most stable triple bond and why Cr has the most stable quadruple bonds etc. I know this does not address many of the questions posed directly, but then it is a complex topic! Organic chemists need only handle eg 2s/2p hybridizations, but with metals one must handle both s/p, s/d and p/d hybridizations. What I might do is expand the MO pictures in the post into a more detailed analysis of how each orbital arises. You can find explanations of this in the key references that I cite in the post if you really want to. Oh, and do go visit Webelements. That has a fund of useful information, and also the Orbitron!